So ladies, how do you get into character when you’re playing a baby animal instead of a human child? Brenna: I try think about some of the puppies that I’ve been around lately, and channel them. Melissa: It’s really fun because there’s a good balance between showing that you’re a mischievous little kid and also a puppy. Kailee: There’s that nice balance and it’s also a challenge, because you have to still let the character read to the audience and tell the story. Olivia: It actually feels like a cartoon character. These pups have a lot of energy. What is the relationship between the pups and the Mother Wolf? Kailee: Louisa set everything up with a good relationship between the wolf family. There’s a good connection there that we’ve been able to build off of in rehearsals. Do any of you have a favorite part of the ballet? Olivia: I love the handshake. Brenna: Louisa asked us to create our own special handshake for one section of the ballet. We found inspiration from all over- movies, ballets, sports. Olivia: it’s one of the most genuine moments because we are actually having so much fun. Melissa: Everyone is really focused and present with their partners, because there are so many parts to the handshake. Kailee: Each of the wolves personalities come out in the handshake a lot. What makes this version of “The Three Little Pigs” different from the story everyone knows? Olivia: It’s not a bad guy and a good guy. This version tells two stories, the wolves and the pigs. Melissa: It was a very smart way to do it, I think. The kids can come away with this perspective that people may have reasons for acting out. It teaches a good lesson, which was just so smart of Louisa to weave in. Also, the way Louisa laid out the ballet, every character is important. It’s very smart. Olivia: Each new character that gets introduced, the audience will fall in love with. Kailee: Yes, every character counts. Melissa: And there’s so much to see. You need to see it a few times to catch everything! Louisa has been a dancer here in the past. How is it now, having Louisa back- and in front of the studio this time? Olivia: Everything about this ballet is just so cute and fuzzy feeling! Kailee: Sometimes when your colleague turns boss, it can be a struggle, but there were no feelings of animosity. Everything was so respectful and just smooth and lovely. Brenna: Louisa thought of everything. From the choreography, to the costumes, and the sets. She had a plan. Olivia: And a plan B! Kailee: And the pantomime is so good, there’s no need for narration in the ballet! Children will easily be able to follow the story. I know you all have a special place for ChatterBOX Theatre in your hearts. Why is ChatterBOX so fun for the dancers? Brenna: Children is the most fulfilling audience. Olivia: When the kids are right there in the Black Box, you can hear every comment from them and it’s so cute. Kailee: They are so honest, and so excited to see us after the show. It makes me so happy. Melissa: If you’re doing ChatterBOX, and you have to do something ridiculous to make kids laugh, it makes dancing something vulnerable in a more sophisticated show a bit easier. Like everything just becomes normal, even if it’s absurd, haha! Are you excited for the ChatterBOX Ball? Brenna: We’re so happy to the generous support from our neighbors at Seven Stars Bakery. Melissa: We’re celebrating 10 years of bringing people together over cookies and conversation! Everyone should come celebrate with us! Thank you so much, dancers and Seven Stars Bakery! To meet all of your favorite characters at the ChatterBOX Ball, this Sunday March 24, at 5:30 pm, click here for tickets! Ask anyone at FBP and they’ll tell you: We are a family! That’s why we are so thrilled to welcome one of our favorite FBP family members, Louisa Mejeur back to Providence to create a brand new, updated version of The Three Little Pigs for the ChatterBOX Theatre, running March 23-31. How does it feel to be back in Providence (all the way from Japan!) working with the Company again? It feels wonderful be back in Lil’ Rhody with my Festival family. Of the many places I have lived in the US, New England feels the most like home. As for FBP, I have been working on this ballet off and on for a year now, and it is incredible to finally see it come to life with a company I know and love. What made you want to choreograph a ballet for children? It has been next on my list for a while now. I have choreographed shorter works and wanted the chance to flesh out an entire story. I also wanted to harness the special joy and energy that comes when you perform for children. When dancing with FBP, the Discover Dance school shows of Nutcracker and the ChatterBOX Theatre performances were some of my favorites, because the kids were so open and appreciative of what they like. My hope is also that the dancers embrace the love in it and experience freedom and joy when they perform it. Why do you think it’s important that children be involved in the arts? I think kids should be involved in the arts so that it gives them a specific outlet for their creativity because they gush it forth like a fountain! Have you ever listened to the babble that comes out of a two year old? Have you seen the pictures kids draw, the dance moves they whip out, or the way they try and solve problems? I believe getting them involved in the arts shows them how to focus their creativity to achieve new things. Tell us a bit about your version of The Three Little Pigs. I changed the story line to make it less morbid. No child should see a wolf eat a pig onstage, no bueno. I gave the pigs some backstory by making them apple farmers. After a big storm, the pigs come to a new area of the forest looking for a place to rebuild their home and plant a new orchard. Along the way, they meet other delightful barnyard animals who join their cause to build a home. Those pups are pretty adorable. What else makes this ballet special? First is the music- I am using Beethoven’s 6th Symphony, the “Pastoral.” As a child, I used to sit in front of our stereo for hours listening to this music, envisioning sheep frolicking in a field and a fearsome storm wracking the forest. I know from experience this is a piece of music children relate to! Secondly, the updated villain in the piece may be relatable for some audience members. I hope kids are able to see that many times we act out because we are hurting inside or have misplaced desires. Lastly, the variety of inspirations for the piece including observing my dog, my sister-in-law’s chickens, and YouTube videos of wolves has given me a whole new vocabulary of “animal” movements. I was also inspired by learning about Kali, Filipino stick fighting, wind storms, and the silliest types of dancing you can imagine up to bring this all together! The biggest challenge turned out to be the non-dance-related things: the set design, costume design, lighting design, and music editing, which I don’t have much experience with. I was blessed that my mother is an engineer and volunteered her time to create an incredible set house. Thank you, Mom. All these challenges were made more difficult by communicating halfway around the world! In Japan, I would wake up early and chat with Misha and my mother while it was evening in the States. It was hard for me to manage up my time and keep all my mental ducks in a row. Since the first time you choreographed on FBP, you’ve danced with other companies and lived in a few different locations. How has your choreographic style evolved with this? I am going to give you a long, nerdy answer for this one! When I teach kids about choreography, I always label learning a new technique, style, or idea about movement as “putting a new tool in their choreographic toolbox.” Every company I have danced with has given me “more tools” to chisel out a piece that communicates what I want. I danced with a modern company in Virginia for two years, where I learned the Hawkin’s technique, which emphasizes the clarity of gestures and more stark, static movement. It was here I learned that every movement actually said something. From the modern Graham technique, I learned new ways to spiral and contract the torso, especially gaining articulation in your sternum and collarbone. The biggest “tool shop” for me came when I attended Nederland Dans Theater’s Summer Program. I had the honor of working on a solo by Crystal Pite, a choreographer who is a role model of mine. She changes the traditional soft-shape of the dancing hand and gives it so much energy and weight that you can use it as an initiator. I chose this as a defining characteristic of the wolves in The Three Little Pigs. Most importantly, I learned Gaga Technique, an improvisational style in which dancers are given verbal prompts but every movement that comes out is entirely their own. It helped me find out how MY body likes to move and communicate. Lastly, moving to Japan gave me the gift of TIME to develop my style. To choreograph, I need the freedom to sit down and listen to a piece of music over and over and over again. Though my career is not what I have expected it to be, this time in Japan has given me the opportunity to do something I have always wanted to do–choreograph this ballet! We are so happy to have you back in Providence! What is it about FBP that keeps you coming back? Thank you, Louisa! To see The Three Little Pigs, click here. All dressed up and no where to go? Head to the ballet! What’s more fun than getting all dressed up for a night at the theater? Give those new shoes a chance to dance. Drama, drama, drama. Looking for a dose of drama but craving a break from the soap opera you’ve been binge-watching? Don’t worry we won’t tell…grab yourself a ticket to “MIRRORS” and let Viktor Plotnikov’s Coma quench your fix. Everyone needs some good old fashion romance once in a while. Kick hallmark cards to the curb and give your honey what they really want this Valentine’s Day! Plus there’s a beautiful, historic hotel right next door to the theater…hint, hint. “Everything is beautiful at the ballet!” The famous “A Chorus Line” lyric said it best, ballet is just pure beauty in all its forms, from the sweepingly effortless Serenade to the intricately physical Smoke & Mirrors. Need we say more? What are you waiting for?! Snag your tickets here or call (401) 421-ARTS. Katie and Charlotte having tea at Seven Stars Bakery. Emotion, romance, and passion take the stage this Valentine’s Day weekend (February 15-17) in “Mirrors”. Featuring three ballets in one evening, this varied program offers something for everyone. We sat down for a coffee break with Dancer’s Katie Bickford and Charlotte Nash to hear a bit more what it’s been like working on this epic show. Katie: In Coma, the Dark Angel is not a man or a woman, but some sort of nonhuman presence. She is this creature who is aware of everyone’s emotions, which seem to be projected onto her. Charlotte: Yeah, and the emotions change from one movement to another. In the first movement, I feel a sense of intensity as Dark Angel. Then the third movement feels like you have been set free. Katie: For me, the entire ballet, Coma, feels like one moment, but from different perspectives. The first movement represents the torment of the dancers visiting their loved ones, while the third movement shows the light, optimistic perspective of the dancers portraying coma patients. The Dark Angel is still manipulating the dancers, but it feels more childlike and playful. She is very dynamic. Katie Bickford as Dark Angel in Viktor Plotnikov’s Coma. Photo by Dylan Giles. Katie: In Serenade, we are very feminine. We are women. In both ballets, The Dark Angel has a sense of knowledge of what is going to happen. Charlotte: In both Serenade and Coma, the Dark Angel also has that ability to guide people through the ballet. Both ballets are really challenging in different ways. Technically Serenade is very difficult, there is a lot of extreme bending and unusual steps that you might not typically do in a classical ballet. In Coma, the style of movement can make you feel a bit out of control all the time, which can be tough to manage, but also exciting. Katie: In Coma, the music does not support us the same way it does in Serenade. The music is inspiring the feeling behind the movement, but not dictating the steps the way it does in Serenade. I feel a sense of freedom in Coma. Charlotte: Yes, the specific musical counts in Serenade can be difficult to perfect. It can be hard to keep it looking fresh and natural, while still being on time with specific counts, but that’s the beauty of the challenge. Sometimes when I go into Serenade, I’m thinking about my character in Coma, bringing something supernatural to the role. I like how Dark Angel feels more grounded than the other principals. There is something different about her. Katie: Deborah [Wingert, of the George Balanchine Trust] was saying Dark Angel in Serenade shouldn’t be cold, but she’s slightly closed off and less emotional than the other women. I think this really helps the character feel more “other”. It relates to Coma because in that ballet we are more creature than human. Charlotte: In the famous pose during the final Elegy section of Serenade, Dark Angel is hovering above the Waltz Girl, acting as the wings, rather than a full human body. Charlotte Nash as Dark Angel in George Balanchine’s Serenade. Photo by Dylan Giles. Charlotte: I feel so grateful to be doing both of these beautiful ballets. Just being a part of them is something special. I am in awe when I watch them. Katie: I feel grateful too, I just want to give as much as I can to them. I hadn’t seen either of these ballets before, so my interpretation feels very much my own. Charlotte: Woking with Deb [of the Balanchine Trust] was amazing. Hearing all of her stories from working with Balanchine was really special. Katie: Deborah is a very positive person. Everything she said really made sense, which made learning the ballet very fun. Charlotte: It was interesting to work with Viktor on Coma, because he seems very attached to this ballet. It seems like Coma is his baby, so he has a lot of input about the emotions. Katie: There are so many little details in Coma, and every movement means something to him. It’s rewarding to interpret that intricacy. Charlotte: Balanchine is always romantic, even without a literally story. Katie: There is a lot of emotion in both ballets. They are so different. They will touch you in different ways. They are full of human emotions that anyone can relate to. Charlotte: They are both so beautiful. Everyone should see them! In Coma, there are miniature love stories happening throughout. It’s heartbreaking and beautiful. Thank you, ladies! To see Coma and Serenade on stage, click here for tickets. Deeply emotional, dark, but touching, Viktor Plotnikov’s Coma immediately captivated audiences when it premiered in Providence in 2007. A stunning work of contemporary dance created on Festival Ballet’s dancers by our resident choreographer, Coma has become a hometown favorite among Rhode Island dance fans and an anxiously anticipated event whenever it reappears in FBP’s repertoire. Likewise, our dancers relish the chance to devour Plotnikov’s rich movement and dive into the emotional depths of this ballet each time it makes a reprise. In honor of Coma’s return to the stage in Festival’s upcoming Mirrors program we are resurfacing this interview by local arts and culture writer Johnette Rodriguez, published after FBP’s most recent run of Coma in 2014. Peek into Plotnikov’s creative process as he describes his sources of inspiration for this epic ballet. The second section of Coma deals directly with two people coming to terms with their loss, as the woman visits her male companion for the last time. The choreographer knows deeply and precisely what he wants to convey in the intricate partnering of the two dancers: the female initially inconsolable, the male trying to comfort her. At one point the male dancer holds her slumped across one knee while she circles her feet along the floor, wrung-out but resigned to what she must do. The third section, in contrast, is, “peaceful, happy, like little kids,” he stresses. Indeed, the dancers march doll-like, arms swinging along their sides; they surprise each other with playful swipes; they treat each other as jungle gyms, sliding over and under torsos and legs; two dancers even hang monkey-like, one from each shoulder of a third dancer. The dancers also strike poses that evoke the long coma hours that stretch into infinity: pendulum arms, rocking bodies, ticking limbs. Connecting the three movements of Coma is a female figure in black, taken to be the “Death Angel/Doctor/Dark Matter/what we call God,” in Plotnikov’s words. At the end of the third section, even after the Angel switches off the light, he wants to show the perpetuity. The movement stops, but the energy does not. Life keeps going on around and beyond the dying or the dead. Written by Johnette Rodriguez. Originally published March 2014 in The Providence Phoenix. Don’t miss Coma in “Mirrors” Feb 15-17 at The Vets. For details and tickets, click here. Performance photos by Thomas Nola-Rion. Rehearsal Photos by Dylan Giles. Romance. February in Rhode Island is cold and dark- let the ballet light up your love life with an unexpectedly hot date night this year! George Balanchine’s sumptuous Serenade is sure to sweep you off your feet. Let us catch you. Unplug and join the conversation. New Year’s Resolution to decrease your screen-time? A company premiere by renowned Yury Yanowksy, Smoke and Mirrors offers social commentary on our increasingly digital world. The concept is expertly expressed by Yanowsky’s use of, yes, smoke and mirrors, but also an interesting costume element; The women are dressed in corsets with handles that allow their partners to lift and manipulate them in entirely new ways. “It’s all smoke and mirrors,” Yanowsky said in an interview, adding, “The story is reflected in the corsets and how we are puppets of the system and how we try to get out.” Make your voice heard. Witness genius choreography. This program marks the long-awaited return of Viktor Plotnikov’s popular dance-drama, Coma. The contemporary ballet was created by FBP Resident choreographer Plotnikov and debuted with immediate critical acclaim, being touted as “original, haunting and chilling, surreal and sad, and just plain mesmerizing” by the Providence Journal in 2007. The emotional work has earned Plotnikov international recognition from Dance Magazine as a choreographer who “revere[s] tradition, while forging a new language, and still command[ing] the attention of an everyday family audience.” Come see for yourself. Expand your playlist. From Tchaikovsky’s stirring Serenade for Strings, to “Fast & Furious 6” Composer Lucas Vidal’s futuristic soundscape for Smoke and Mirrors, to Arvö Part’s iconic musical works driving the emotional Coma, the music of “Mirrors” will transport you from one world to another. Each composition exudes the spirit of the ballet it reflects- the stirring spirit of romance, the apocalyptic disconnect of our changing society, and the raw, tender beauty of an unknown limbo. Listen up. Respect your roots. The first work the New York City Ballet founder and legendary choreographer created in the United States, George Balanchine’s Serenade is an icon and testament to the brilliance of its maker. The ballet evolved over time, with nuances that have since become quintessential quirks. Check out our post here for more on the fascinating history of Serenade…and study up! Support progress. “Mirrors” features two Company premieres in one night. That’s two masterpieces that have been celebrated by art-lovers across the globe, coming right to your backyard in Rhode Island for the first time ever! Don’t miss the chance to participate in progress in your Creative Capital. Hope to see you there! “I have been looking forward to FBP’s Mirrors program all season. As a lover of dance and dance educator, it’s such a treat to see these three powerful works on one program. I’m especially thrilled for the return of Viktor Plotnikov’s Coma, one of the most beloved ballets in FBP’s repertory and a particularly special memory from my career as a dancer. Coma could be described as a “drama,” but it’s so much more than that. 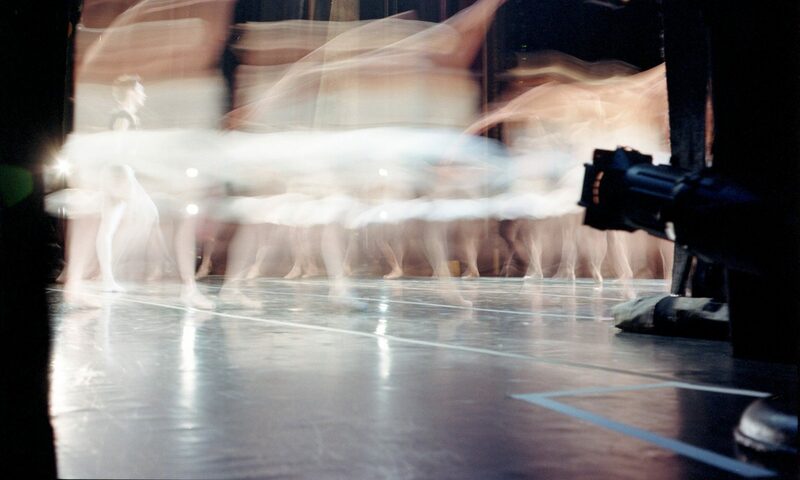 I remember working with Viktor while creating this ballet in 2007, watching his imagination pour out into the movement. I had known Viktor from our time together at Boston Ballet, but I had never seen a choreographer work like this before. The ballet is both technically challenging and emotionally powerful. The rest of the “Mirrors” program is so diverse, with the Rhode Island premiere of George Balanchine’s Serenade, which I have danced elsewhere and just adore. I especially love the corps de ballet, which shows you how important teamwork can be and what it can produce. The word “corps” comes from the Latin for “body,” and in Serenade you can really see that the corps is a moving body of strong women working together. I’m also excited to see Yury Yanowsky’s Smoke & Mirrors for the first time. I have known Yury for years and his work is unique and bold. It is going to be a provocative statement piece with some really cool movement and ideas. As a young aspiring dancer in Lithuania, I would frequently see shows at the National Opera & Ballet Theater, sitting in the audience wishing I could dance in the spotlight one day. I remember leaving the theater feeling just…full. Full of inspiration, full of questions and ideas about what I had seen, full of passion for this art form. Putrius (third from left) in class at M.K. Ciurlionis Arts School in Vilnius, Lithuania. Putrius (far left) with her classmates M.K. Ciurlionis Arts School in Vilnius, Lithuania. Ms. Putrius serves as the Festival Ballet Providence School Director. Festival Ballet presents “Mirrors” at The Vets Feb. 15-17, 2019. Click here for more information. Coma photos by Thomas Nola-Rion. Say the word “serenade” in a group of ballet dancers and immediately you’ve conjured visions of pale blue gossamer tulle floating midair to Tchaikovsky’s dramatic score. The word “serenade” (that’s, “ser – eh – nahd” darling!) fills a dancer’s ears with a full orchestra of powerful strings and enlivens their muscles to unconsciously float into intricate formations. This is because Serenade is the title of choreographic legend George Balanchine’s most iconic work. Created in June of 1934 for the School of American Ballet, Serenade was the first piece Balanchine choreographed in America. It has since become one of New York City Ballet’s signature works. When the great choreographer was creating this piece for the students of his school, he originally began as a lesson in stage technique. This is evidenced in the final product, with unique elements that the audience should enjoy searching for. For example, when a student fell during rehearsal, this was added into the official choreography. When another student arrived late one day, this too was incorporated into the ballet. Balanchine’s affinity connection to the composer is certainly apparent in Serenade, the dancers dictating ever delicate intricacy in the powerful score. Those who knew Balanchine recall that for him, music was paramount. This perhaps explains why Serenade appears to be a plotless ballet, though the emotion expressed and relationships formed onstage call forth a different response from each individual audience member. For its iconic history, its breathtaking movement, and its masterful music, don’t miss Balanchine’s Serenade, coming to The Vets stage this February as part of FBP’s MIRRORS. Repertory notes provided courtesy of and adapted from New York City Ballet Online Repertory Index. Photos of Miami City Ballet by Gene Schiavone. Aza: “I’m also excited for Yury [Yanowsky]’s piece, “Smoke and Mirrors”. I really enjoyed his previous piece, “Reverso”, so I can’t wait to start this next one. Thank you Aza and João! To see these two in action, grab your tickets to MIRRORS here. Special thanks to Seven Stars Bakery for sponsoring this post. Nutcracker season is a very special time of year at the ballet. The dancers are all working hard together to bring this spectacular story to life, and there is certainly a feeling of magic in the air. For two dancers, teamwork and friendship doesn’t just follow their Nutcracker season, it fuels it. So girls, I think the whole audience must be wondering: What does the energy backstage at PPAC before a performance of The Nutcracker feel like? Sami: I get very excited but try to stay calm so I don’t mess up on stage. When I am with Gabby, I feel better because she makes me so happy and less jittery. Gabby: It is a happy feeling backstage. I like being with Sami backstage because she is my friend. She is my special friend. We stretch together. Sami helped me with my makeup. Sami helps me on stage. We take fun pictures together in our costumes. Do you have any special rituals or things that you like to do together before you go on stage? Gabby: I like to eat my snack with Sami. We read books. I like to hug Sami. She helps me pay attention. We do thumbs up. What makes performing The Nutcracker alongside your friend so special to you? Gabby: She is my friend. I like to be silly with Sami. Sami: It is very cool that Gabby is accepted in the dance world because she is super sweet and deserves to shine like the rest of us. Having her on stage is just so much fun. This year, Sami, you are dancing the role of Clara! How exciting! Have the two of you done anything special to prepare for this new role? Sami: I still cannot believe that I am Clara this year. I’ve looked up to all of the Clara’s since my first Nutcracker over 7 years ago. To learn more about the role and find more ways to express Clara’s emotions, I’ve enjoyed watching Live Streams of The Royal Ballet rehearsing their Nutcracker. I also communicated with a former Clara, Olivia Luciano, for additional insights and moral support. Gabby: I love Sami. Clara is my favorite in the Nutcracker. I was Clara for Halloween last year. Gabriella’s mom, Tabitha: Gabriella said “ I have good news, Sami is Clara!” This was one day after a rehearsal. She truly is so thrilled that Sami is Clara. All I have to say if Gabriella is having a tough time transitioning to rehearsal is, “Gabriella, you are going to see Sami and Gabi (Sami’s sister) today at dance!” Gabriella gets right up and is motivated and focused to go to rehearsal. She can’t wait to be with them. I love to watch Sami dance. How has your friendship helped shape the way you dance? Gabby: I can’t wait to go to dance to see Sami. Sami helps me. Sami is my friend. Sami help me to do my Nutcracker moves. Sami: When I am dancing and I need to express happiness, I think about Gabby and it instantly makes my dancing more cheery! Students backstage at PPAC as Party Girls in FBP’s The Nutcracker, Gabriella Sluter pictured in the foreground and Samantha Shorr directly behind here.